A solo exhibition of contemporary sculpture by Los Angeles, artist Janet Levy, her first in Mexico. Levy focuses on the physical and conceptual exploration of stone. Using alabaster, onyx and marble, she creates abstract sculptural forms and installations, expressing an inherent desire to reveal what is concealed. As Levy carves, binds and hangs the stone, she draws from inner tensions of opposing forces and emotional exchanges, exploring an enduring focus within her practice: to make the invisible visible. 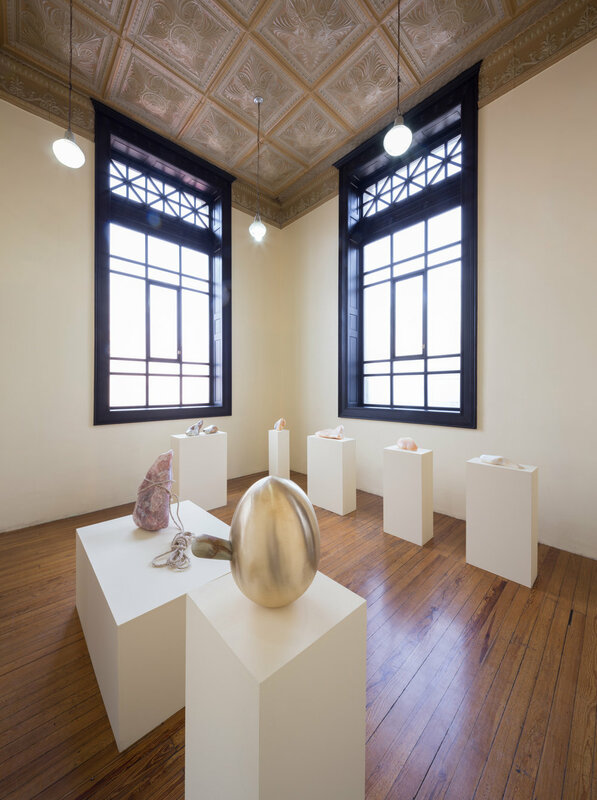 This exhibition showcases new sculptural works and installations created in her studio in Mexico City from the ongoing body of work Butterfly Double using Mexican materials, a series of carved abstract chrysalis forms in marble and onyx. Continuing with the theme of concealing and revealing not only in the conceptual or psychological context but also in the the physical material itself. In referencing stories, memories, objects of nature, the physical body or situations in the psyche, ultimately she creates abstract sculptural forms that convey or evoke essential dualities and sexuality. The title of this series Butterfly Double is a reference to double entendre and dualities. Though her extensive research of the butterfly life cycle she is capturing the energy of the invisible feeling (thing) in the middle, the motion right before bursting through or emerging and making it visible As in her previous series “Bite Down” seven abstract reptile teeth she references, nature and animal instincts to convey underlying pressures, sexuality, tensions and desires. For Butterfly Double, Levy continues with her existing artistic monologue whilst introducing new themes of transformation and attraction.